BAMAKO/GENEVA (Reuters) - Mali is trying to trace as many as 343 people linked to confirmed and probable Ebola victims in an effort to control its second Ebola outbreak, health officials said on Friday. An initial batch of contacts linked to a 2-year-old from Guinea who died of Ebola last month were close to the end of their 21-day quarantine period when Mali confirmed a second, separate batch of cases this week. There have been at least four more confirmed Ebola cases in this second episode, all linked to an imam who entered Mali from neighbouring Guinea and died late last month with Ebola-like symptoms that were not recognised. Three of these have died so far. Samba Sow, the head of Mali's Ebola response, said on state television two more suspected cases were being tested. Malian Health Ministry spokesman Marakatie Daou said a woman who had helped wash the imam's body died on Thursday at the Gabriel Toure Hospital in Mali's capital, Bamako. Daou said an initial Ebola test result for the woman was positive, making her the fourth clinically confirmed Malian case, although further analysis would be carried out abroad. Mali's government said on Friday afternoon 256 contacts had been identified and would be monitored. A spokeswoman for the World Health Organisation said the number of contacts that needed monitoring had risen to 343 by Friday evening, underscoring the scale of the task health workers have in containing the second wave of cases. Reuters journalists outside the Nenecarre mosque in Bamako's Djikoroni Para neighbourhood, where the imam's body was washed, said four health workers in protective gear entered the mosque to disinfect it but no effort was made to stop people from entering for Friday prayers. Cases are being traced in a number of locations across Bamako and on the porous border with Guinea. These included the Pasteur Clinic, which treated the imam but has since been quarantined. It is not connected to the Institut Pasteur, a French-based institute specialising in infectious diseases. 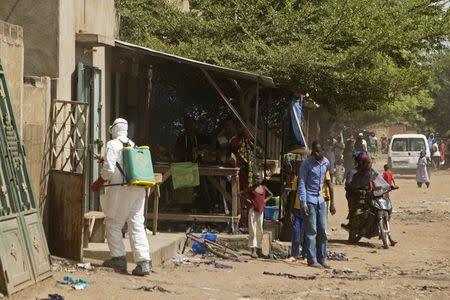 Mali is the sixth nation to have confirmed Ebola in West Africa, which is battling the world's worst epidemic of the haemorrhagic fever on record. At least 5,177 people have been killed since it erupted in March. The former French colony shares an 800-km (500-mile) border with Guinea, where the first case of Ebola in the region was reported. In a sign of growing concern over the new wave of cases, the French government on Friday updated its website to advise against all but essential travel to Bamako and Kayes, the western region where the girl died.